Every so often I go on a Bach kick, a period of concentrated listening to the master whose music is forever fresh, forever engrossing, forever surprising in its infinite inventiveness. In the midst of my current Bach-fest, I came across a New Yorker article that quoted Schopenhauer’s distinction between talent and genius: “Talent is like the marksman who hits a target which others cannot reach; genius is like the marksman who hits a target as far as which others cannot see.” That sums up Bach’s genius. Herewith then, are some recent Bach recordings that enlivened this round of immersion in his music. Johann Sebastian BACH: Two and Three Part Inventions, BWV 772-801; French Suite No. 5, BWV 816. Till Fellner (pno). ECM 2043 (http://www.ecmrecords.com/). Fellner’s 2004 recording of Part One of The Well-Tempered Clavier whetted my appetite for more of his Bach, especially for WTC Part Two. So the arrival of this disc occasioned some slight disappointment, quickly dispelled as its first notes emerged from the loudspeakers. The Inventions are didactic works, designed to guide pupils through the thickets of keyboard playing, with specific reference to finger dexterity and — almost an oxymoron at a time when “keyboard” usually meant “harpsichord” — a cantabile style of playing. As if that wasn’t enough of a load to bear for pieces of less than two minutes’ duration, the works were supposed to demonstrate how musical ideas can be transformed into fully satisfying statements via creative use of counterpoint and other rigorous compositional techniques. 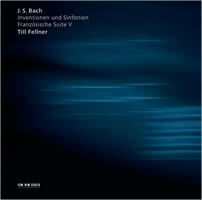 I’d always thought of the Inventions as mildly interesting exercises lying outside the main body of Bach’s great works. Fellner’s performance has changed my view. His readings are suffused with exquisite phrasing — melodies are beautifully shaped, emerging from the dense part-writing with unsuspected cogency. Fellner reveals emotional depths in the music I hadn’t imagined. His trills are uncommonly even and weighted with feeling — listen to the treble and bass trills in the seventh of the Two-Part Inventions to hear the structural and emotional weight he gives them. In the Three Part Inventions (or Sinfonias, as ECM titles them), the ninth, in G minor, with its sense of regret and sadness, has a Schubertian sense of drama. In the booklet interview Fellner rightly calls it the “cycle’s expressive climax.” The French Suite No. 5, BWV 816 completes the disc. Fellner, again at the top of his form, projects the Sarabande with austere beauty, a mournful aria followed by a perky Gavotte whose bouncy melody sticks in the mind. And it’s all recorded with the truthfulness that typifies ECM’s productions; a warm midrange flanked by sparkling trebles and solid bass lines enabling the dense strands of these 30 gems to emerge with clarity. Now can we please get Fellner’s WTC Part II? Johann Sebastian BACH: The Well-Tempered Clavier, BWV 846-93. Angela Hewitt (pno). Hyperion CDA67741/4 (http://www.hyperion-records.co.uk/). Distributed in the US by Harmonia Mundi (http://www.harmoniamundi.com/). 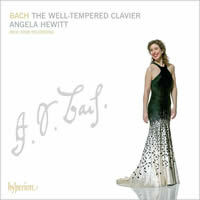 I wish I could be as enthusiastic about Angela Hewitt’s new recording of the complete WTC. She has an enormous following, an extensive catalogue of well-received Bach recordings, a year-long Bach World Tour playing the WTC, and the consistent raves of the English reviewers. Despite all this, I simply haven’t warmed to her as a pianist or as a Bach specialist. Put it down to an inexplicable blind spot if you will, but I heard nothing to change my mind in this, her second recording of WTC in a decade. I tried. I heard some very nice things on these discs — a poetic sensibility, a greater clarity of contrapuntal lines, and a lovely sound drawn from the Fazioli piano about which she enthuses in the booklet notes. But all this went for naught when I compared her playing of the C Major Prelude and Fugue of Book I with Fellner’s recording. Fellner’s Prelude is well-shaped, with finely judged dynamic and tonal variations that make the music breathe; his Fugue sharply etched, with rhythmic life. Hewitt’s Prelude, by contrast, sounded spongy, and the Fugue disfigured by hiccup-like rhythms and pecked notes (or, more politely, detached articulation) that put me in mind of chickens in a barnyard. It’s not all like that, but first impressions can be hard to overcome. Compared to her earlier recording, she exhibits greater rhythmic freedom and tonal shadings but also more of the calculated micromanagement that left me cold. Mine may be a minority opinion, but I’d say the Brits need to rethink their premature beatification of Hewitt as Bach’s High Priestess. Johann Sebastian BACH: The Well-Tempered Clavier, BWV 846-93. Konstantin Lifschitz (pno). VAI DVD 4488 (http://www.vaimusic.com/). More to my liking is Lifschitz’s WTC, a DVD of his March 2008 concert performance at the Miami International Piano Festival. He plays with all the poetry one could ask for, and with a rhythmic life that transmits an abundance of energy to the fugues. He employs a wide dynamic range and a color-suffused tone that, for good or ill, makes that Book I C Major Prelude sound almost like an Impressionist work. It took a bit of getting used to but when an idiosyncrasy like that works — and it does here — one can label it “personal” or “inventive.” I’ll hasten to add that such shenanigans are very rare in this traversal of the “48” and don’t detract from the overall impact, especially when the contrapuntal core of the cycle is enhanced by Lifschitz’s rhythmic acuity and delineation of inner voices. The video makes all this even more comprehensible, with well-placed views of his keyboard fingerings. But while lauding the results of his individual, personal approach to music whose minimal textual instructions can easily bear it, there is one oddity — Lifschitz, for some unexplained reason, conflates the two Books of WTC. Each Prelude and Fugue from Book I is immediately followed by the parallel work from Book II. That’s a new one on me — I’m not aware of anyone doing that before, probably because it’s a bad idea. But then, it’s easy enough to right that particular wrong by using the chapter options on the DVD. With discreet video — no flashy directorial touches that distract from the music — and excellent sound and performance, Lifschitz’s WTC is an easy way to get lost in the dense forests of Bach’s endlessly fascinating masterpiece. Johann Sebastian BACH: Solo Cantatas BWV 35, BWV 169, BWV 170. Bernarda Fink (mezzo); Freiburger Barockorchester, Petra Müllejans (dir.). Harmonia Mundi HMC 902016 (http://www.harmoniamundi.com/). If you’ve heard Bernarda Fink’s recital recordings you know what to expect: a fine mezzo-soprano voice, stylistic exactitude, and sensitivity to textual nuances. Those attributes help make her traversal of three solo cantatas such a satisfying disc, especially when she’s supported by the excellent period musicians of the Freiburger Barockorchester, who play with a warm tone that perfectly complements her voice. 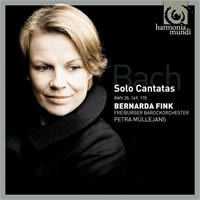 These three cantatas also give the group’s organist, Wolfgang Zerer, plentiful opportunities to shine. Not the least of their attractions are the extensive solo organ movements in Cantatas 35 and 169, mini-concertos Zerer plays with panache, as he does in the various vocal movements where the organ has a prominent obbligato role. But it’s Fink’s show, and it’s a good one except for a few passing moments where a pitch droops or a vowel turns cloudy, easily overlooked in the overall excellence of her singing. If one is in a carping mood, it would be possible to object to an occasional misjudged tempo, as in a too-slow “Stirb in mir,” from Cantata 169. But set against such minor flaws is Fink’s way with the text. Without overstressing words or syllables, she nails the precise emotional weight specific images need to make their full impact. Since all of these cantatas deal with the singer’s impatience with earthly life and desire to be with God in Heaven ASAP, such verbal acuity is essential for a first-rate performance, such as those on this fine disc. Johann Sebastian BACH: Cantatas BWV 22, BWV 23, BWV 127, BWV 159. Dorothee Mields (sop), Matthew White (alt), Jan Kobow (ten), Peter Kooy (bs); Collegium Vocale Gent, Philippe Herreweghe (cond.). Harmonia Mundi HMC 901998 (http://www.harmoniamundi.com/). A Bach cantata CD with Herreweghe’s name on the cover virtually guarantees performances worth hearing, and this one’s no exception. 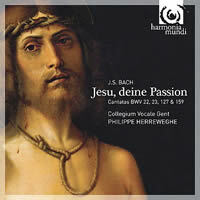 The album title, “Jesu, deine Passion,” signals that these are Easter Cantatas, each written for the Sunday before Lent, each with texts suffused with emotional power, each with music that combines gravity with melodies and orchestral colors that increase their power. Each also offers opportunities for soloists and chorus to demonstrate their skills in making Bach’s music come alive for modern listeners. Of particular note are soprano Dorothee Mields’ movingly sung “Die Seele ruht in Jesu Händen” in BWV 127, bass Peter Kooy’s recitative “Wenn einstens die Posaunen schallen” with stirring trumpet obbligato, and his rendition of “Es ist Vollbracht” from BWV 159, and tenor Jan Kobow’s aria “Mein alles in allem” from BWV 22, a work further enlivened by Herreweghe’s perfect pacing and dance-derived rhythms. Matthew White failed to shake my conviction that a mezzo or contralto is far preferable to a countertenor, whatever the current period practice orthodoxy may hold. It’s impossible to find further praise for a chorus whose tonal character and phrasing are so perfect a fit for this music, nor to overpraise a conductor who brings out the weighty expressiveness as well as the silver rays of joy. And while we’re handing out stars for excellence, let’s not forget the orchestra, whose ensemble playing and individual obbligato contributions are outstanding, or the engineers who captured it all in warm, full, transparent sound. Johann Sebastian BACH: Brandenburg Concertos, BWV 1046-51. 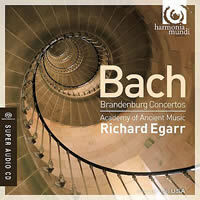 Academy of Ancient Music, Richard Egarr (cond.). Harmonia Mundi HMU 807461.62 (2 SACDs) (http://www.harmoniamundi.com/). There’s more tonal warmth on offer in another period-instrument performance from Harmonia Mundi, Richard Egarr’s new take on the ubiquitous Brandenburg Concertos. I’m not sure yet another set of the Brandenburgs is something the world’s been waiting for. Despite its considerable merits these Brandenburgs don’t match Egarr’s recent excellent Handel recordings. All through these six delectable works I felt that something was missing, and indeed at least a dozen musicians were missing since this version hews to the latest trend in HIP (historically informed performance) practice, the insistence of one player to a part in Bach’s orchestral works. There’s no point in getting into a big discussion about this; there are enough warring experts on both sides of the issue. My feeling is that such miniaturization of Bach is as amusical as the swollen full symphony orchestra accounts of a less enlightened era. So let’s just say that I don’t care for Bach Lite and move on. Egarr’s tempos are moderate, and if he loses some surface excitement he does elicit warm, sensuous playing. Some of the warmth comes from his choice of a lower pitch. Egarr says he uses the “French” Baroque pitch of A = 392 since French instruments were supposedly “dominant” in Bach’s area at the time the Brandenburgs were written. Maybe. But all this musicological justification edges into the absurd when Egarr also uses a theorbo and guitar as added continuo color for no better reason than that they’re “a delicious luxury which I couldn’t forgo.” Why go to the extreme fundamentalism of one player to a part and then indulge in a minor heresy regarding the continuo? Egarr, in his booklet notes, says his personal favorites among Brandenburg recordings are Alfred Cortot’s from 1932 and Pablo Casals’ from 1950. They’re mine too, along with Fritz Busch’s from 1935 and Benjamin Britten’s from 1969, all examples of performances true to the core of Bach’s music, full of life and soul, transcending the dismal concerns of HIP theorists. Based on his Handel recordings and aspects of this Bach set, as well as his discerning admiration for the above-mentioned vintage versions, I hope Egarr will revisit the Brandenburgs without getting bogged down in the outer precincts of HIP theories that diminish the music. Johann Sebastian BACH: Concerto for two violins, BWV 1043; Violin concerto, BWV 1041; Violin concerto, BWV 1042; Concerto for oboe & violin, BWV 1060. 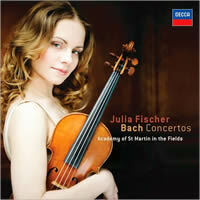 Julia Fischer (vln), Alexander Sitkovetsky (vln), Andrey Rubtsov (ob); Academy of St. Martin in the Fields. Decca B0012490 (http://www.deccaclassics.com/). Fischer’s debut recording for Decca may not duplicate the revelatory experience of her early Pentatone discs, but it’s a sparkling example of her accomplished violinism. She always seems to bring a sense of spontaneity to her playing and it’s in evidence in this Bach program. The two Violin Concertos are the centerpiece, and she plays them with beautiful tone, apt phrasing and lively tempos. The slow movements could be more rapt, but that would imply adding a veneer of Romanticism and Fischer is too conscious of appropriate Baroque style to do that. There’s an expressive cost to such an approach, of course, and it’s most obvious in the Concerto for two violins, where the glorious Largo, so intense and moving in the version by David and Igor Oistrakh, comes off as strait-laced, almost bland. But there are compensations too — the outer movements of all the concertos on this disc have a technical perfection and naturalness that increase our enjoyment of the music. The double concerto with oboe is a special pleasure, the music so alluring and the playing so fetching as to disarm criticism. The Academy of St. Martin in the Fields play like angels, with a warm string tone, but this is really Fischer’s show and it’s a good one.